The trillion-dollar iDevice maker has crushed the market for patient investors. These three businesses could fare even better. It's no mystery that Apple (NASDAQ:AAPL) has achieved jaw-dropping gains for early investors. Keeping in mind that shares of the $1 trillion tech titan trade at around $230 as of this writing, astute investors could have purchased them for under $2.00 per share as late as 2004. And it wasn't just early investors who enjoyed the fruits of Apple's success; the stock has more than tripled over the past five years alone. That naturally raises the question: Are there any stocks on the market today that could deliver even sweeter returns? We asked that question to three top Motley Fool contributors. Read on to learn why they think Workday (NASDAQ:WDAY), Exelixis (NASDAQ:EXEL), and A.O. Smith Corporation (NYSE:AOS) could possibly put Apple's returns to shame. An Apple a day? How about a hard day's work? Steve Symington (Workday): Shares of Workday are already up 50% so far in 2018, thanks largely to its habit of beating expectations and raising its guidance as enterprise clients continue to transition their legacy HR implementations to cloud-based software -- which means they're flocking to its core Human Capital Management and, more recently, its newer Financial Management and business analytics platforms. As it stands, Workday boasts a 98% customer satisfaction rate with more than 2,200 enterprise customers of all sizes and across various industries. Among its new customers in its most recent quarter were IKEA, Unisys, Sprouts Farmers Markets, and a Fortune 100 pharmaceutical client. As such, Workday's subscription revenue last quarter grew more than 30%, to just over $500 million, offering an increasingly predictable revenue stream and free cash flow to help the company invest to extend its industry leadership. All told, Workday is successfully taking market share from its larger competitors with addressable markets totaling more than $70 billion, leaving a long runway for growth considering its revenue this fiscal year is "only" expected to arrive at around $2.7 billion. For investors willing to buy now and watch Workday sustain its momentum, the stock could offer exceptional gains over the long term. Sean Williams (Exelixis): Though Apple and its cash hoard are difficult to top, I would (and already have) put my money on cancer drug developer Exelixis to outperform a majority of high-profile names, including Apple. Back in 2014, Exelixis' future was very much in doubt after its lead drug, now known as Cabometyx, failed miserably in the Comet studies for patients with metastatic castration-resistant prostate cancer. Since then, though, it's been off to the races. Keeping in mind that therapies can act differently depending on the cancer type, Cabometyx wound up wowing in patients with advanced renal cell carcinoma (RCC). The drug became the first to hit the "trifecta" in second-line RCC of a statistically significant improvement in objective response rate, progression-free survival, and overall survival, cementing its place as a major second-line player. Not long after, it hurdled Bristol-Myers Squibb's (NYSE: BMY) blockbuster cancer immunotherapy Opdivo with its phase 2 Cabosun results, expanding Cabometyx's label to include first-line advanced RCC ahead of Opdivo. Taking into account Exelixis' market share in RCC, as well as its potential to partner with Bristol-Myers' Opdivo in combination therapies for RCC, the company should remain healthfully profitable on a recurring basis. Exelixis also appears to be on the verge of expanding its label once again after its phase 3 Celestial trial in patients with advanced hepatocellular carcinoma (HCC) easily hit its primary endpoint. And, finally, there's Cotellic's potential (a secondary revenue generator for Exelixis) as a combination therapy with Roche's (NASDAQOTH: RHHBY) Zelboraf in select types of metastatic melanoma, and other possible combination studies with Roche. Add this up, and Exelixis has a real shot at averaging top-line growth of perhaps 25% a year through 2022, as well as push toward $2 in full-year earnings per share. If Exelixis doesn't get gobbled up by a growth-hungry pharmaceutical company, its fundamentals should carry it to significant gains. 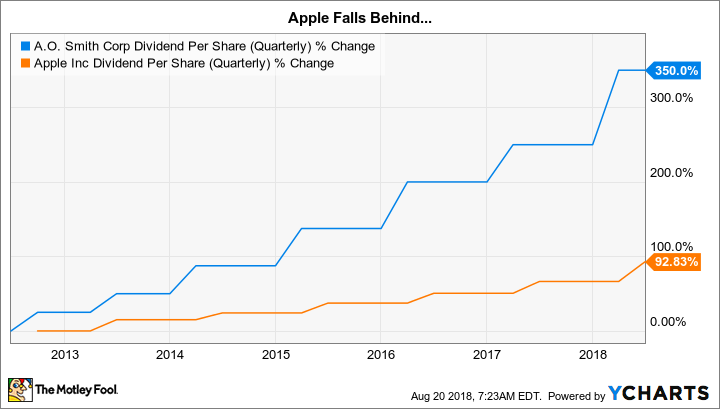 Reuben Gregg Brewer (A. O. Smith Corporation): You wouldn't think it possible, but Apple's stock advance over the past decade is roughly the same as a company that makes water heaters. That may sound fantastical, since water heaters are among the most boring things imaginable compared to an iPhone. But I assure you that A. O. Smith Corporation's water heater business is growing rapidly in places where hot water is considered a luxury. The big growth driver over the last decade was China, where revenues advanced at around 21% a year. And as this giant nation continues to move its population up the socioeconomic scale, there's likely more growth ahead. Helping to ensure that growth is Smith's move into air and water purification, two other things we take for granted in the United States. But that's not the only growth driver. Smith is also expanding in India, another giant developing nation where residents are entering the middle class and buying the luxury of hot water as soon as they can. Like China, Smith sees India as a mega-trend, with its target market expected to grow from 3% of the population in 2018 to 24% by 2030. That's a huge growth opportunity for A. O. Smith to exploit, and one that should help keep the top and bottom lines growing at a heady pace. AOS Dividend Per Share (Quarterly) data by YCharts. There's one other thing to like about Smith, and that's dividend growth. The dividend has been increased for 25 consecutive years with a compound annual growth rate of 17% over the past decade. Believe it or not, not even Apple has kept up with that! We're certainly not guaranteeing that these companies will be the "next" Apple. But between Workday's industry-leading products and enormous addressable markets, Exelixis' market share in RCC and expanding pipeline, and A.O. Smith's growth potential and history of outperformance, we think chances are high that they could generate superior returns for patient shareholders over the long term.